Sony is running an in-store campaign for “Eye Candy”, showcasing the HD capacity of its Sony Bravia television screens and providing homage to the global brand message of “make.believe”. 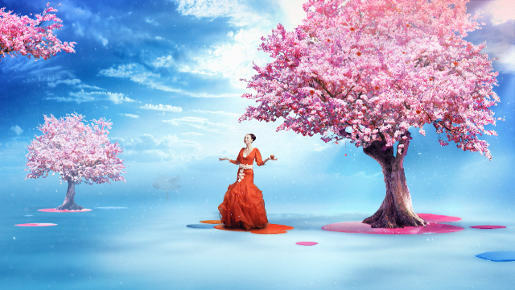 The video unfolds in three parts, “Birth of Color,” “Explosion of Color,” and “Release of Color”. The concept was inspired by the idea that from one’s imagination anything is possible. Drawing from the theatrical world of fashion photography, production group Superfad chose moments of visual drama and magic, with spherical objects representing the dot in “make.believe” as a connecting through-line. The Eye Candy campaign was developed at chickINchair Productions by executive producer Kim Tierney. Filming was shot by director Will Hyde via Superfad with director of photography Martin Ahlgren, production designer Jason Puccinelli, wardrobe designer/stylist Heidi Meek, make up artist Bryin Smoot, line producer Scott Ludden. Design and animation were produced at Superfad by executive creative director Will Hyde, creative director Carlos Stevens, CGI/VFX director Dade Orgeron, 3D artists Tom Oakerson, Phiphat Pinyosophon, Andrew Butterworth, Yas Koyama, Alex O’Donnell, Dimitri Luedemann, Billy Maloney, compositors Tom Oakerson, Paulo Dias, Loren Judah, Dorian West, Sohee Sohn, John Stanch, Soyoun Lee, Dimitri Luedemann, David Holm, editor Ryan Haug, Flame artist Andy Davis, head of production Chris Volckmann, executive producer Rob Sanborn and composer Matt Hutchinson.